Building a new home is an exciting, but often overwhelming time. I understand the enormity of the project and just how important - and more cost-effective - it is to make the right decisions from the start. Engaging the services of an experienced interior designer for your new home build is not just a luxury – it is a valuable investment long-term. You benefit from sound advice, access to industry experts as well as supplier discounts and you will avoid making costly and often irreversible errors. A stylish window dressing can make a huge difference to any room – however it’s not an investment that you want to have to replace often. 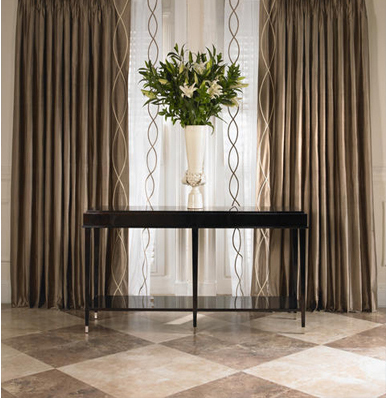 Well-selected curtains or blinds should add value and enhance the aesthetic of a room while also providing privacy and warmth. As a window dressings specialist, I can help you make the best decision when it comes to choosing which window dressing is right for your requirements, and then help you perfectly match fabrics and materials to complement your existing colour palette and home decor colour scheme for a harmonised living space. For more information regarding my Auckland based specialist window dressing services, please get in touch I can provide expert advice on bathroom design and kitchen design, both interior and exterior house colour schemes, lighting, bespoke fit-outs and window dressings, as well as concepts for furniture and soft furnishings that complements the style of architecture and the home’s surrounds. I often work alongside industry specialists, including architects and designers, to ensure there is cohesion and flow between the various aspects of your home, such as your kitchen design and bathroom design. I empower my clients by giving them the confidence to make decisions often outside of their comfort zone. I’ll get to know you and the lifestyle requirements of your home to provide solutions that resonate with you and inspire you to create a space that is not just a house, but a home. Contact Dianne to discuss your new build project, or find out more about Dianne’s Auckland interior design and project management services.